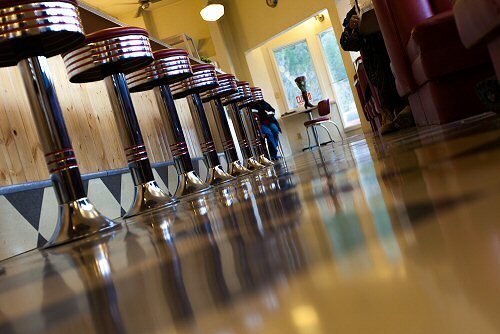 Serving classic American comfort food, from burgers and steaks, fries and milkshakes, to our homemade soups, pies and pastries, made at the café daily. 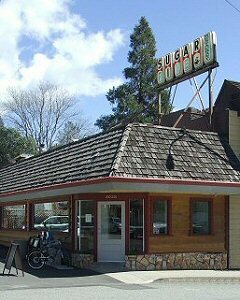 Currently serving breakfast and lunch, the Sugar Pine is open seven days a week from 7:00am until 3:00pm. 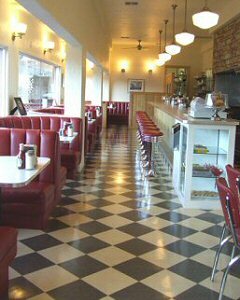 Off-street parking is available, and the café offers comfortable booth seating as well as a classic diner counter with stools. We pride ourselves on making your food from scratch here at the cafe, where the baker arrives early in the morning to prepare the day's pies, turnovers, muffins and other tasty bakery goods. As the day progresses, cooks prepare soups, sauces and salads, and an American country tradition, homemade biscuits and gravy. We are happy to offer Peet’s coffee and teas. Not only is the town of Mariposa a good way to get to Yosemite Valley, it’s also a great place to stop and explore. First settled in 1849, the town is a living reminder of the gold rush era and the 49’ers who prospected the mother lode. The California State Mining and Mineral Museum is located here, as is the Mariposa Museum and History center. With a fine selection of coffee shops, restaurants, motels, hotels and shops, Mariposa makes an excellent stopover on the way to the National park as well as a wonderful destination for sightseeing, shopping, dining and relaxation. Hope to see you soon!